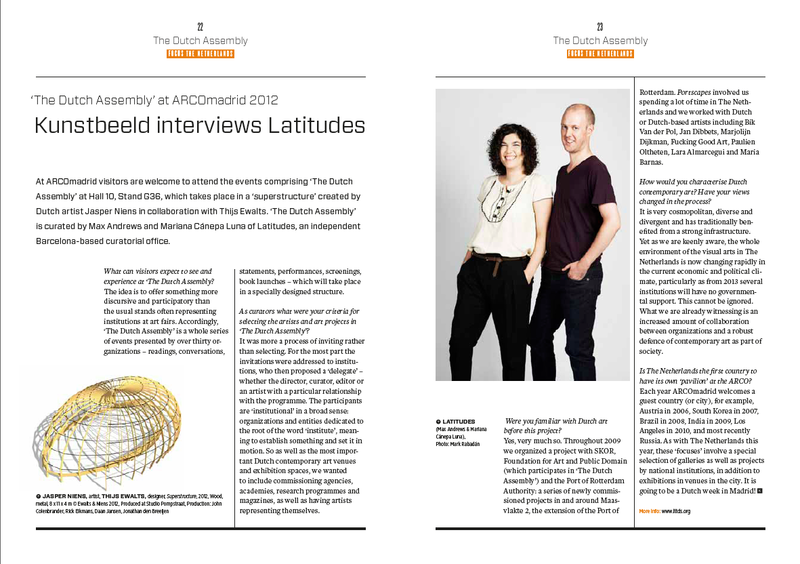 In 2005 Max Andrews and Mariana Cánepa Luna founded Latitudes, a curatorial office based in Barcelona, Spain, that works internationally across contemporary art practices. Latitudes has worked in a variety of formats and situations including more than 40 projects encompassing exhibitions, public realm commissions, film screenings and discursive programmes. Expertise includes commissioning site and context-specific artworks, leading online and printed editorial projects, as well as convening and taking part in a workshops and conferences. Latitudes has worked with artists including Lara Almarcegui, Maria Thereza Alves, Amy Balkin, Mariana Castillo Deball, Heman Chong, Jan Dibbets, Dora García, José Antonio Hernández-Díez, Nicholas Mangan, Joan Morey and Lawrence Weiner; and has organised exhibitions at venues including the CAPC musée d’art contemporain de Bordeaux (2017–18), Museu d'Art Contemporani de Barcelona (MACBA) (2016), Museo de Arte Contemporáneo Castilla y León, León (MUSAC) (2011), Kunsthal Århus (2011), Museum Boijmans Van Beuningen, Rotterdam (2010), Arnolfini, Bristol (2009) and the Fondazione Sandretto Re Rebaudengo, Turin (2008). Latitudes developed a year-long series of ten public realm projects in the Port of Rotterdam (2009–10) and initiated a series of interventions in unconventional public and private spaces on the occasion of the first two editions of the Barcelona Gallery Weekend (2015 and 2016). 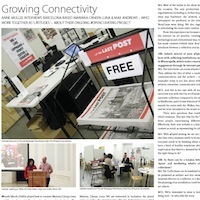 Some of Latitudes' most singular projects have questioned the linear sequence of research, production and presentation, including solo projects produced for the two editions of ‘NO SOUL FOR SALE’ (X Initiative in New York, 2009 and Tate Modern in London, 2010) and producing ten weekly tabloids “live-edited” throughout and within ‘The Last Newspaper’ exhibition at the New Museum, New York (2010). Latitudes has participated in public lectures, conversations and panel discussions at the Fundació Antoni Tàpies, Barcelona (2017), ARCOmadrid (2011, 2017), de Appel, Amsterdam (2016), Chisenhale Gallery, London (2015), Athens Biennale (2015), The Common Guild, Glasgow (2013), Sharjah Art Foundation (2012); has been faculty at The Banff Centre in Canada (2015 and 2017), facilitated a 10-day curatorial intensive for the NUS Museum in Singapore (2014), convened and hosted 30 hour-long presentations during ‘The Dutch Assembly’ (ARCOmadrid, 2012), and organised the three-day symposium for the Sharjah Biennial 8 (2007). Participation in residencies has been crucial in expanding Latitudes’ research and has included fieldwork in Askeaton Contemporary Arts, Ireland (2018), KADIST, San Francisco (2015), Gertrude Contemporary, Melbourne (2014), Spring Workshop, Hong Kong (2013), Casa del Lago, México DF (2012), and Frankfurt Kunstverein (2008). Editorial projects have resulted in publications including ‘LAND, ART: A Cultural Ecology Handbook’ (Royal Society of Arts/Arts Council England, 2006), the monograph ‘Lara Almarcegui: Projects 1995–2010’ (Archive Books, 2011) and artist books by Martí Anson (Save As...Publications, 2011), Christina Hemauer and Roman Keller (Kunsthal Århus, 2011) and Simon Fujiwara (Archive Books, 2009). Moreover, writing in catalogues and magazines has formed an integral part of Latitudes’s critical engagement with contemporary artistic practices and has included contributions to catalogues for institutions such as CAIRN Centre d'Art (2019), IMA Brisbane/Monash University Museum of Art (2016), MACBA (2016), MUSAC (2012), New Museum (2010), and the Walker Art Center (2007), amongst others. Since 2016 Latitudes has edited ‘Incidents of Travel’, an online series documenting an offline day between curators and artists, and has tutored Barcelona Producció, artistic production grants awarded each year by the Barcelona City Council. Max Andrews (b. 1975) is a Bath-born, Barcelona-based curator. Max obtained a BA (Hons) in Critical Fine Art Practice at the University of Brighton (1995–98), before completing the MA Curating Contemporary Art, Royal College of Art, London (2001-3). He was Curatorial Fellow at the Walker Art Center, Minneapolis (2003-4) and Special Projects Curatorial Assistant to Director, Tate Collection, London (2004-5). In 2005 he founded the curatorial office Latitudes with Mariana Cánepa Luna. Latitudes has worked internationally across contemporary art practices in a variety of formats and situations, including more than 40 projects encompassing exhibitions, public realm commissions, film screenings and discursive programmes. Expertise includes commissioning site and context-specific artworks, leading online and printed editorial projects, as well as convening and taking part in a wide variety of workshops and lectures. Since 2015 Max has been Contributing Editor of frieze magazine, where he has written since 2004. Mariana Cánepa Luna (b. 1977) is a Montevideo-born, Barcelona-raised curator. She graduated in Art History from the Universitat de Barcelona (1995–2000) and studied Cinema History at DAMS, Università degli Studi di Bologna (1999) before completing the MA Curating Contemporary Art, Royal College of Art, London (2002–4). She assisted the curators of the retrospective ‘Frank Gehry, Architect’ at the Solomon R. Guggenheim Museum, New York (2001), and was Fondation de France Curatorial Fellow at the Serpentine Gallery, London (2004–5). In 2005 she founded the curatorial office Latitudes with Max Andrews. Latitudes has worked internationally across contemporary art practices in a variety of formats and situations, including over 40 projects encompassing exhibitions, public realm commissions, film screenings and discursive programmes. Expertise includes commissioning site and context-specific artworks, leading online and print editorial projects, as well as convening and taking part in a wide variety of workshops and lectures. Mariana is a regular contributor to art-agenda and since 2015 is a board member of the Fundació Privada AAVC governing Hangar—Centre of Production, Research and Visual Arts in Barcelona. Forthcoming Parallel Rooms, Art Basel Cities: Buenos Aires talks programme hosted in collaboration with arteBA, Buenos Aires, 13 April 2019. (MCL) Exhibition tour on Rosemarie Castoro, MACBA, Barcelona, 9 December 2017, 10 and 31 March 2018. Convenor, 'The Return of the Earth. Ecologising art history in the Anthropocene’, CAPC musée d’art contemporain de Bordeaux, 15 November 2017. Lecture, Visual Art Lecture Series, Banff Centre for Arts and Creativity, Banff, Canada, 12 September 2017. In conversation with Haegue Yang, Fundació Tàpies, Barcelona, 3 May 2017. Seminar, ‘Institutionalise or not institutionalise’, Professional meeting convened by Chris Sharp, ARCOmadrid, 24 February 2017. Lecture, You're such a curator!”, De Appel Curatorial Programme Summit, Amsterdam, 23–24 November 2016. Panelist, ‘Rethinking Institutions’, ‘OMONOIA’ Summit, Athens Biennale 2015–17, 18–19 November 2015. (MA) Lecture, The Shock of Victory Symposium, Centre for Contemporary Art, Glasgow, 25 September 2015. Convenor, Seminar, ’Near-Future Artworlds Curatorial Disruption Foresight Group’, Kadist Art Foundation, San Francisco, 29 August 2015. Lecture, Visual Arts Lecture Series, Banff Centre, Canada, 28 July 2015. In Conversation with Nicholas Mangan, Chisenhale Gallery, London, 7 July 2015. (MA) Panel discussion, Stroom Invest Conference, Stroom Den Haag, The Hague, 3 June 2015. Convenor, symposium 'When Does an Exhibition Begin & End', National Library Building, Singapore, 14 June 2014. Lecture, MADA | Monash University Art Design & Architecture, Melbourne, 14 May 2014. (MA) In conversation with Remco Torenbosch, Fundació Tàpies, Barcelona, 18 March 2014. Lecture on Roman Ondák, The Common Guild, Glasgow, 21 November 2013. In conversation with Alejandro Cesarco, galería Parra & Romero, Madrid, 4 June 2013. Lecture and panelist, 'Within the public realm', Dublin City Gallery, The Hugh Lane, Dublin, 12 March 2013. Practice presentation, Centre for Contemporary Art Derry, Northern Ireland, 9 March 2013. Convenor, #OpenCurating: Latitudes in conversation with Yasmil Raymond, Auditori MACBA, Barcelona, 19 February 2013. In conversation with Heman Chong, Spring Workshop, Hong Kong, 2 February 2013. Seminar, Intervention at the Asia Art Archive, Hong Kong, 31 January 2013. (MCL) Lecture, Cultural Professions: the Curator, Aula de Cultura CAM, Murcia, 17 October 2012. Reader, Readers' Circle: 100 Notes—100 Thoughts, 'Lawrence Weiner IF IN FACT THERE IS A CONTEXT', dOCUMENTA (13), Kassel, 9 September 2012, 19h. Lecture, ‘The curatorial contract: analogies and case studies’, Centro Galego de Arte Contemporáneo, Santiago de Compostela, 14 June 2012. Panelist, 'Working with Artists and Audiences on Commissions and Residencies', March Meeting 2012, Sharjah Art Foundation, United Arab Emirates, 17–19 March 2012. Lecture, ’Anti-monument. Criticism in Public Space', Espai d'Art Contemporani Castelló, 22 October 2011. Convenor and chair, Four case studies of artistic education in the context of 'Campus', Espai Cultural Caja Madrid, Barcelona, 28 and 30 June 2011. In conversation with Lara Almarcegui and Cuauhtémoc Medina, TENT, Rotterdam, 19 May 2011. Panelist, ‘IMAGINE - towards an eco-aesthetic’, Kunsthal Arhus, Århus, 22 January 2011. Lecture, 'Hot Type/Fresh Ink/New Blood', New Museum, New York, 20 November 2010. Lecture, 'Vic Cambrils Barcelona...A Library Project', Midway Contemporary Art, Minneapolis, 21 October 2010. Presentation on Lara Almarcegui and 'Portscapes', students from CUArch (The Catholic University of America School of Architecture and Planning) and UTSA CoA (The University of Texas at San Antonio College of Architecture), Collective Intelligence by Polyplicity, Barcelona, 22 March 2010. Lecture, 'Master on Contemporary Art: Analysis and Management', Universitat de Barcelona, 23–24 November 2009. Lecture and seminar, Art and Ecology, The Wanås Foundation, Knislinge, Sweden, 21 October 2009. Lecture, 'Produce, Exhibit, Interpret (Strategies and conflicts in today's curatorial practice)' Matadero Madrid, 25–27 September 2009. Open seminar with Neil Cummings, ‘Museum Futures’, Arnolfini, Bristol, 18 July 2009. Panelist, ‘The Canòdrom, a new facility in Barcelona seen by artists, critics and curators’, MACBA, Barcelona, 6–7 July 2009. Practice presentation, in the context of the film programme '¿What are we going to do after we've done what we are going to do next? ', produced for 'Uncertainty Principle', Capella MACBA, Barcelona, 10 June 2009. Lecture and panel, 'Out of the Studio! A symposium on art and public space', Hasselt, Belgium, 26–28 October 2007. Lecture, 'Qui Enter Atlas. International Symposium of Young Curators', 3–5 June GAMeC, Bergamo, and 19-21 October 2007 in S.M.A.K., Ghent. Seminar, ‘Barcelona / Such a beautiful horizon: Critical social infrastructure to promote art scene health resilience’, BAR Tool #2, Barcelona, 29 October 2018, 22 January and 5 March 2019. Mentor, Barcelona Producció 2017, production grants awarded to David Mutiloa; Anna Moreno and Camille Orny & Magda Vaz, La Capella, Barcelona, 2017–18 season. Mentor, BCNProducció 2016, production grants awarded to Pau Magrané; Antoni Hervàs and Joana Hurtado Matheu. La Capella, Barcelona, 2016–17 season. Workshop, ’Near Future Artworlds Curatorial Disruption Foresight Group’, Eastside Projects, Birmingham, 15 November 2015. Workshop and public lecture, 'Beyond the roundabout, or what’s public about public art? ', organised by consonni. Tabakalera, Donostia, 10–11 November 2015. Visiting Lecturer, MA Curatorial Practice, California College of Arts, San Francisco, 8 September 2015. Guest Faculty, ‘Blueprint for Happiness’, The Banff Center, Canada, 27 July–7 August 2015. Tutors, International Curatorial Retreat. Organised by Vessel and Monash Art Design and Architecture (Melbourne), Bari, Italy, 9–13 May 2015. Lecture and workshop, Open Set – Graphic Design Summer School in Rotterdam, Witte de With, Rotterdam, 31 July 2014. Lead facilitator, Curating Lab 2014 Curatorial Intensive, National University of Singapore and Hong Kong, 11–20 June 2014. Seminar, Curatorial Practice Phd programme, MADA | Monash University Art Design & Architecture, Melbourne, 14 May 2014. (MA) Visiting lecturer, IDEP Escuela Superior de Imagen y Diseño, Barcelona, 12 March 2014. (MCL) Visiting lecturer, course 'On Mediation – Theory and Curatorial Practice in Global Art’, Universitat de Barcelona, 27 November 2013. Seminar, course 'Curating the present. Theory and practice of the contemporary art exhibition', La Casa Encendida, Madrid, 16 November 2013. Visiting Lecturer, Master Visual Arts (MAVIS), Dublin, 8 March 2013. Lead facilitator, Nature Addicts! Fund Travelling Academy within the framework of dOCUMENTA (13), Kassel, Germany, 11–15 September 2012. Visiting Lecturer, Máster en Arte, Museología y Crítica Contemporáneas, Universidad de Santiago de Compostela, 15 June 2012. Campus, project directors and mentors, Espai Cultural Caja Madrid, Barcelona, 4–29 July 2011. Seminar, 'Curatorial practices. About the different formats in curatorial practices', A*Study, organised by A*Desk, Barcelona, 9–13 May 2011. Expert Forum, Masters of Contemporary Art: Analysis and Management, University of Barcelona (online), 23–24 October 2009. Visiting lecturer, MA Curating Contemporary Art, Royal College ofArt, London, November 2009 & October 2008. Visiting lecturer, De Appel Curatorial Programme, Amsterdam, February 2009. 2016: “El misterio de Caviria” by Antoni Hervàs awarded the Premi Ciutat de Barcelona in Visual Arts; and Artistic Project by the Associació Catalana de Crítics d’Art. Project mentored by Latitudes. 2015–19: (MCL) Board member, Fundació Privada AAVC governing HANGAR Centre of Production, Research and Visual Arts, Barcelona. 2012: Inaugural BCN Producció 2012 research grant, Barcelona Culture Institute, Barcelona City Hall. 2012–14: International Association of Curators of Contemporary Art, IKT. 2010–13: Programme Committee, Hangar, Barcelona. 2010: Premios GAC 2010, curatorial category (inaugural), Catalan Gallery Association, Barcelona. 2018: (MCL) Premis Ciutat de Barcelona, Visual Arts category, Barcelona Culture Institute, Barcelona City Hall. 2017: Barcelona Producció 2017, Barcelona Culture Institute, Barcelona City Hall. 2016: (MCL) Creation Award, Fundació Ramon Llull, International Promotion of Catalan Culture, Barcelona. 2016: Art Nou/Primera Visió, La Capella and Art Barcelona – Associació de Galeries, Barcelona. 2016: BCN Producció 2016, Barcelona Culture Institute, Barcelona City Hall. 2015: #Opening prize, ARCOmadrid, Madrid. 2015: Nominator, Aimia | AGO Photography Prize, Art Gallery of Ontario, Toronto, Canada. 2011, 2012 and 2013: 'Curatorial Open Call 2013' Galería NoguerasBlanchard, Barcelona/Madrid. 2011: (MCL) Premis GAC 2011, Barcelona. 2011: Projects & curatorial grants, Sala d’Art Jove, Barcelona. 2008: Miquel Casablancas Prize Jury, Centre Cívic Sant Andreu, Barcelona. Welcome to the Neighbourhood, Askeaton Contemporary Arts, Askeaton, Ireland, 20–29 July 2018. Research residency, CAPC musée d’art contemporain de Bordeaux, April–May 2016. Kadist Art Foundation, San Francisco, 26 August–9 September 2015. Visiting Curator Program, Gertrude Contemporary, Melbourne, 12 May–7 June 2014. Spring Workshop, Hong Kong. In the context of the programme Moderation(s), 7 January–10 February 2013. Casa del Lago, México DF, 18–27 September 2012. Deutsche Börse Residency Programme, Frankfurter Kunstverein, Frankfurt, August 2008. Natàlia Farré, ‘Sumisión y frío en la Modelo’, El Periódico, 15 enero 2019. Maria Palau, ‘Angoixats a la Model’, El Punt Avui, 13 gener 2019. Pía Cordero, ‘COL·LAPSE, o l’avenir il·limitat de l’obscenitat’, nuvol.com, 6 desembre 2018. Pablo Larios, ‘curated_by Viennaline: Other Gallery Shares Should Take Note’, frieze.com, 25 September 2018 (in print, November-December 2018). Max L. Feldman, ‘CURATED BY_VIENNA 2018’, Spike Art Magazine, 25 September 2018. Tom Jeffreys, ‘Looking Back 2017: Paris’, frieze.com, 8 December 2017. Frank Browning, “Death and Transfiguration’, Huffington Post, November 28, 2017. Bea Espejo, ‘Cambio de tiempo’, Babelia, El País, 19 Agosto 2017. Vanessa Graell, “Fuera del “white cube”’, Suplement Tendències, El Mundo, 29 Setembre 2016. Jörg Heiser, ‘Around Town’, Frieze, January-February 2016. Fede Montornés, ‘Composiciones, Barcelona gallery weekend. Latitudes & Jordi Mitjà, David Bestué, Dora García, Daniel Steegmann y Rasmus Nilausen & Pere Llobera’, blog de Fede Montornés, 9 octubre 2015. Amanda Lee Koe, ‘Hauntological trajectories in “When Does An Exhibition Begin And End?’, Art Asia Pacific's blog, 23 July 2014. Miguel Amado, ‘Iratxe Jaio and Klaas van Gorkum’, Artforum Critics Pick, 3 April 2014. David G. Torres ‘Antropología del trabajo’, El Cultural, 7 marzo 2014. Zoe Li, ‘Moderation(s)": Witte de With and Spring Workshop In Year-long Collaboration’, Blouin ArtInfo Hong Kong, 11 January 2013. Paul Schmelzer, ‘#OpenCurating: Yasmil Raymond on Curatorial Ambassadorship’, Walkerart.org, 12 March 2013. John Jervis, ‘Spring Workshop and “Moderation(s)”’, Art Asia Pacific blog, 1 February 2013. Jolien Verlaek, ‘State of the arts: Spain - the Netherlands. Interview Mariana Cánepa Luna’, Metropolis M, 18 February 2012. Álvaro Calleja, The Dutch Assembly: 'Un Puente entre dos naciones'/'a bridge between two nations', ABCDARCO, 16 febrero 2012. Paula Barriobero, 'Artists at Work: Iratxe Jaio & Klaas van Gorkum', Afterall Online, 8 February 2012. 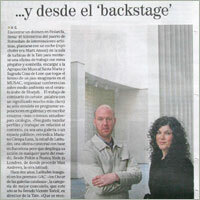 Vanessa Graells, ‘...y desde el backstage’, El Mundo, suplement Tendències, 2 February 2012. Bea Espejo, 'Amikejo, una patria común para Jiménez Landa y Lee Welch', El Cultural, 2 agosto 2011. Jaime Cuenca, 'La producción del valor y sus condiciones. Sobre Klaas van Gorkum e Iratxe Jaio en el Laboratorio 987 del MUSAC', A*Magazine #79, 17 Mayo 2011. Javier Díaz-Guardiola, ‘Comisarios, la nueva hornada’, ABC, 1 April 2011. Maaike Lauwaert, ‘3 x Brussel Gladstone, Hufkens, MSSNDCLRCQ’, Metropolis M (online), 28 March 2011. Claude Lorent, 'Sources de la vie moderne', Arts Libre #95, 25 March 2011. Ole Bak Jakobsen, 'Grøntsager på Maldiverne i den postpetrolistiske tidsalder', www.kunsten.nu, 24 January 2011. Isabel Margalejo, ‘6 Nuevos Comisarios’, AD Architectural Digest España, November 2010. Luc Sante, 'Disappearing Ink', The New York Review of Books's blog, 1 November 2010. Blake Gopnik, 'The Last Newspaper', The Washington Post, 21 October 2010. Holland Cotter, 'Art and News, Intersecting in the Digital Age', The New York Times, 7 October 2010. 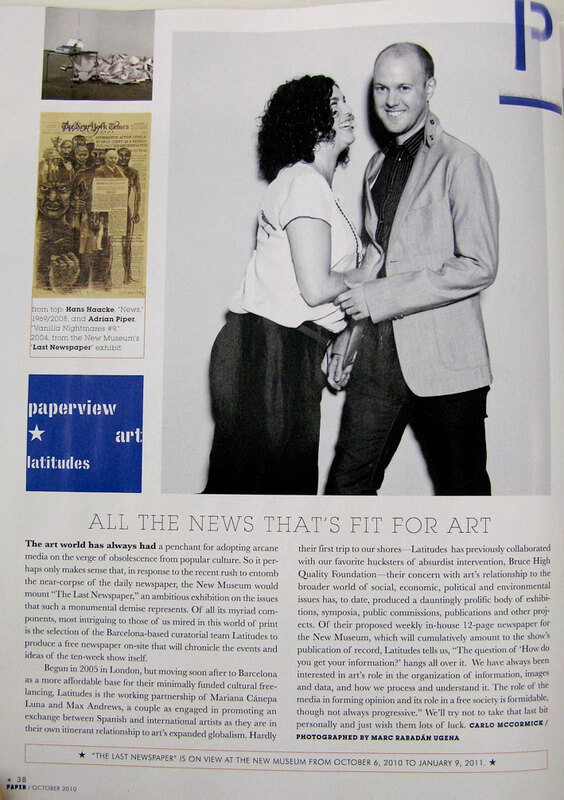 Carlo McCormick, ‘Paperview art: Latitudes’, Paper Magazine, New York, October 2010. Juan Palomo, ‘Otras Latitudes’, elcultural.com, 30 July 2010. Janine Armin, ‘The creative landscape of independent curators’, The New York Times, 15 June 2010. Cristina Garrido, 'Tate, cultura independiente y otros antagonismos', Suplemento 'Encuentros', Diari Tarragona, 29 Mayo 2010, p.12. Javier Hontoria, ‘No Soul for Sale, arte al margen del mercado’, El Cultural, 13 May 2010. Javier Díaz-Guardiola, 'La Tate Modern celebra su décimo aniversario con participación española', ABC.es, 6 Mayo 2010. Carol Vogel, ‘Inside Art’, New York Times, 22 April 2010. Miguel Amado, ’Portscapes’, Critics’ Picks, 6 April 2010. Giancarlo Politi, ‘A Hundred and one curators’, Flash Art, March-April 2010. Teresa Sesé, ‘De profesión: comisario’, La Vanguardia, 2 January 2010. Cecilia Alemani, 'The Bruce High Quality Foundation: Our future is about expansion', Mousse Magazine, Issue #20, September 2009. Burkhard Meltzer, ‘Alles Breibt Besser’, Spike #21, 2009, p. 144-145. Sandra Smallenburg, 'Doelloos dobberen voor de kunst', NRC Handelsblad, 29 August 2009. Pieter Kottman, ‘Jan Dibbets’, NRC Handelsblad, 14 February 2009. ’Dibbets does it again’, Metropolis M, 9 February 2009. Frederic Montornés, 'Lawrence Weiner', EXIT Express, No. 39, noviembre 2008. Violant Porcel, 'En la cresta de la ola', Suplemento Culturas, La Vanguardia, 5 noviembre 2008. Lluís Permanyer, ‘Azúcar Weiner para coleccionistas’, La Vanguardia, 23 septiembre 2008. Bea Espejo, ‘De profesión: comisario’, El Cultural, 31 July 2008. Eva Scharrer, ‘Greenwashing’, Artforum, Summer 2008, p.456. Emily Verla Bovino, ‘Greenwashing’, Critics’ Picks, Artforum, April 2008. Mariano Navarro, 'Verde es el color del dinero', El Cultural, 13 marzo 2008. Noèlia Hernández, 'En alerta siempre', Culturas, La Vanguardia, 9 Mayo 2007, p.22. Brian Dillon, ‘Land, Art: A Cultural Ecology Handbook’, Frieze #108, July–September 2007, p. 49. Vienna Art Week, 18–22 November 2018. Young Curators Invitational programme, organised by Fondation d’Entreprise Ricard, Institut Français and FIAC to visit Paris, 21–26 October 2013. Visit to Athens on invitation of the Athens Biennial 4 team, 11–16 October 2013. Dublin City Council Arts Office trip to Dublin and Derry, Ireland and Northern Ireland, 8–14 March 2013. Mondriaan Foundation Orientation Trip to Amsterdam, Rotterdam and Utrecht, 18–22 July 2011. Christina Li, Interview on 'Incidents of Travel' and Moderation(s), Witte de With website, 2 May 2013. 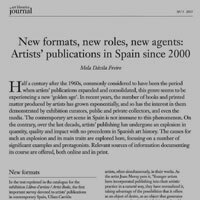 Mela Dávila Freire, 'New Formats, new roles, new agents: Artists' publications in Spain since 2000', Art Libraries Journal, vol. 38 #3, 2013. Gustavo Perez Diez, ‘Los 10 comisarios españoles del 2015’ ARTEINFORMADO, 4 January 2016. 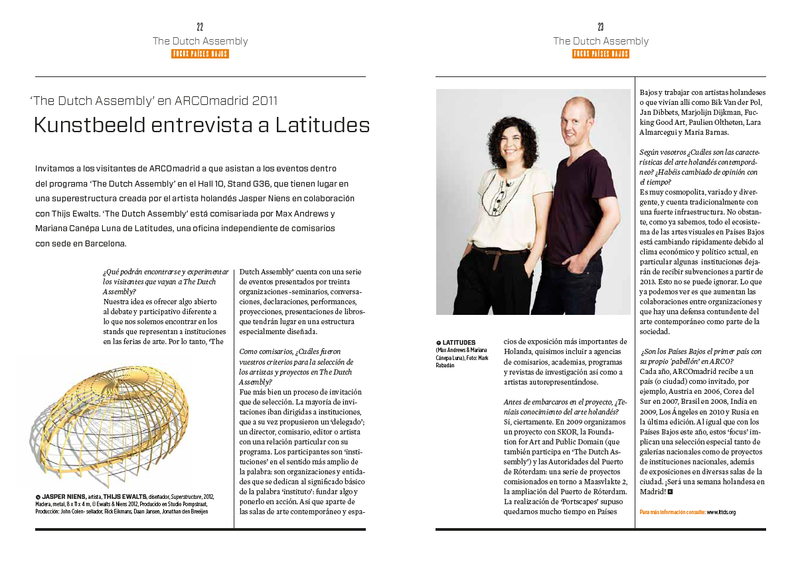 En el 2005, Max Andrews y Mariana Cánepa Luna fundaron Latitudes, una oficina curatorial afincada en Barcelona, que trabaja internacionalmente a través de prácticas artísticas contemporáneas. Latitudes ha trabajado en varios formatos y situaciones, abarcando más de 40 proyectos expositivos, proyectos en el espacio público, ciclos de video y programas discursivos. Latitudes se ha especializado en la producción de proyectos que responden a la especificidad de un lugar, en liderar proyectos editoriales, así como convocar y participar en una variedad de iniciativas docentes, talleres y conferencias. Latitudes ha trabajado con artistas Lara Almarcegui, Maria Thereza Alves, Amy Balkin, Mariana Castillo Deball, Heman Chong, Jan Dibbets, Dora García, José Antonio Hernández-Díez, Nicholas Mangan, Joan Morey y Lawrence Weiner, entre otros; y organizado exposiciones en museos y centros como el CAPC musée d’art contemporain de Bordeaux (2017–18), Museu d'Art Contemporani de Barcelona (MACBA) (2016), Museo de Arte Contemporáneo Castilla y León (MUSAC), León (2011), Kunsthal Århus (2011), Museum Boijmans Van Beuningen, Rotterdam (2010), Arnolfini, Bristol (2009), o la Fondazione Sandretto Re Rebaudengo, Turin (2008). 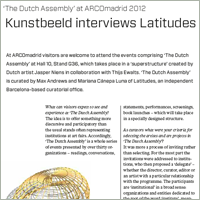 Latitudes encargó una serie de diez proyectos para el espacio público del Puerto de Rotterdam (‘Portscapes’, 2009–10), y comisarió ‘Composiciones’ (2015 y 2016) para las dos primeras ediciones del Barcelona Gallery Weekend, produciendo intervenciones artísticas en espacios públicos y privados de la ciudad condal normalmente inaccesibles. Algunos de los proyectos más singulares de Latitudes han cuestionado la progresiva secuencia investigación-producción- presentación. Entre ellos se encuentran los proyectos individuales producidos para las dos ediciones de ‘NO SOUL FOR SALE’ (X Initiative en Nueva York, 2009 y Tate Modern en Londres, 2010), así como la “edición en vivo” de periódicos semanales durante la exposición ‘The Last Newspaper’, New Museum, Nueva York (2010). Latitudes ha participado en numerosas conferencias, conversaciones y simposios en la Fundació Antoni Tàpies (2017), de Appel, Amsterdam (2016), Chisenhale Gallery, London (2015), Athens Biennale (2015), The Common Guild, Glasgow (2013), Sharjah Art Foundation (2012); y ha sido faculty en The Banff Centre, Canadá (2015, 2017), facilitó un programa intensivo de 10 días sobre comisariado para el NUS Museum, Singapur (2014), ha moderado 30 presentaciones consecutivas durante ‘La Asamblea de los Países Bajos’ (ARCOmadrid, 2012), y organizado el simposio de tres jornadas para la Sharjah Biennial 8 (2007). Latitudes ha disfrutado de residencias que han sido cruciales en la profundización de sus investigaciones e incluido trabajo de campo en Askeaton Contemporary Arts, Ireland (2018), KADIST, San Francisco (2015), Gertrude Contemporary, Melbourne (2014), Spring Workshop, Hong Kong (2013), Casa del Lago, México DF (2012), y Frankfurt Kunstverein (2008). Sus proyectos editoriales incluyen publicaciones como ‘LAND, ART: A Cultural Ecology Handbook’ (Royal Society of Arts/Arts Council England, 2006), la monografía ‘Lara Almarcegui: Projects 1995–2010’ (Archive Books, 2011), y libros de artista de Martí Anson (Save As..., 2011), Christina Hemauer and Roman Keller (Kunsthal Århus, 2011) y Simon Fujiwara (Archive Books, 2009). La escritura en catálogos y revistas especializadas ha sido una parte integral del compromiso crítico que Latitudes mantiene con las prácticas artísticas, e incluido colaboraciones con instituciones como CAIRN Centre d'Art (2019), IMA Brisbane/Monash University Museum of Art (2016), MACBA (2016), MUSAC (2012), New Museum (2010), y el Walker Art Center (2007). Desde el 2016 Latitudes edita la serie online ‘Incidents (of Travel)’ que narra un día offline entre curadores y artistas, y tutoriza las becas de producción artística Barcelona Producció, otorgadas anualmente por el Institut de Cultura de Barcelona. Max Andrews (Bath, Inglaterra, 1975) es comisario y reside en Barcelona. Max estudió Critical Fine Art Practice en la University of Brighton (1995–98) y obtuvo el Máster Curating Contemporary Art, Royal College of Art, Londres (2001–3). Max fue Curatorial Fellow en el Walker Art Center, Minneapolis (2003–4) y Special Projects Curatorial Assistant to Director, Tate Collection, Londres (2004–5). En el 2005 fundó la oficina curatorial Latitudes con Mariana Cánepa Luna. Latitudes ha trabajado internacionalmente a través de prácticas artísticas contemporáneas en una serie de formatos y situaciones, que abarcan más de 40 proyectos expositivos, encargos para el espacio público, ciclos de film y programas discursivos. Latitudes se ha especializado en producir proyectos que responden a la especificidad del lugar, en liderar proyectos editoriales en línea e impresos, así como convocar y participar en una gran variedad de talleres y conferencias. Desde el 2015 Max es Contributing Editor de la revista ‘frieze’, con la que ha colaborado desde el 2004. Mariana Cánepa Luna (Montevideo, Uruguay, 1977) es comisaria y reside en Barcelona. Mariana se licenció en Historia del Arte en la Universitat de Barcelona (1995–2000) y estudió Historia del cine en el DAMS, Università degli Studi di Bologna (1999), antes de obtener el Máster Curating Contemporary Art, Royal College of Art, Londres (2002–4). Mariana asistió a las comisarias de la retrospectiva ‘Frank Gehry, Architect’ en el Solomon R. Guggenheim Museum, Nueva York (2001), y fue Fondation de France Curatorial Fellow en la Serpentine Gallery, Londres (2004–5). En el 2005 fundó la oficina curatorial Latitudes con Max Andrews. Latitudes ha trabajado internacionalmente a través de prácticas artísticas contemporáneas en una serie de formatos y situaciones, que abarcan más de 40 proyectos expositivos, encargos para el espacio público, ciclos de film y programas discursivos. Latitudes se ha especializado en producir proyectos que responden a la especificidad del lugar, en liderar proyectos editoriales en línea e impresos, así como convocar y participar en una gran variedad de talleres y conferencias. Mariana escribe regularmente en art-agenda y desde el 2015 es secretaria y vocal del Patronato de la Fundació Privada AAVC que gobierna a HANGAR Centro de producción e investigación de artes visuales, Barcelona. Próximamente Salones paralelos, programa de charlas de Art Basel Cities: Buenos Aires en colaboración con arteBA, Buenos Aires, 13 abril 2019. (MCL) Visita comentada sobre Rosemarie Castoro, MACBA, Barcelona, 9 diciembre 2017, 10 y 31 de marzo 2018. Moderador, 'The Return of the Earth. Ecologising art history in the Anthropocene’, CAPC musée d’art contemporain de Bordeaux, 15 noviembre 2017. Conferenciante, Visual Art Lecture Series, Banff Centre for Arts and Creativity, Banff, Canada, 12 septiembre 2017. Conversación con Haegue Yang, Fundació Tàpies, Barcelona, 3 mayo 2017. Participantes, ‘Institucionalizar o no institucionalizar’, Encuentro Profesional, ARCOmadrid. Dirigido por Chris Sharp, 24 febrero 2017. Ponencia, De Appel’s Curatorial Programme Summit: ‘You're such a curator!’, Amsterdam, 23–24 noviembre 2016. Panelistas, ‘Rethinking Institutions’, ‘OMONOIA’ Summit, Athens Biennale 2015–17, 18–19 noviembre 2015. (MA) ‘The Shock of Victory Symposium’, Centre for Contemporary Art, Glasgow, 25 septiembre 2015. Seminario, ’Near-Future Artworlds Curatorial Disruption Foresight Group’, Kadist Art Foundation, San Francisco, 29 agosto 2015. Conferenciante, Visual Arts Lecture Series, Banff Centre, Banff, Canadá, 28 julio 2015. Conversación con el artista Nicholas Mangan, Chisenhale Gallery, Londres, 7 julio 2015. (MA) Mesa redonda, Stroom Invest Conference, Stroom Den Haag, La Haya, 3 junio 2015. Organizadores y moderadores, 'When Does an Exhibition Begin & End', National Library Building, en el contexto de CuratingLab 2014, Singapur, 14 junio 2014. Conferenciante, MADA | Monash University Art Design & Architecture, Melbourne, 14 mayo 2014. (MA) Conversación con Remco Torenbosch, Fundació Tàpies, Barcelona, 18 marzo 2014. Conferenciante, Roman Ondák, The Common Guild, Glasgow, 21 noviembre 2013. Conversación con Alejandro Cesarco, Galería Parra & Romero, Madrid, 4 junio 2013. Conferenciante, ’Within the public realm', Dublin City Gallery, The Hugh Lane, Dublin, 12 marzo 2013. Conferenciante, Presentation of Latitudes’ practice, CCA Derry, Irelanda del norte, 9 marzo 2013. Moderador, #OpenCurating: conversación con Yasmil Raymond, Auditori MACBA, Barcelona, 19 febrero 2013. Conversación con Heman Chong, Spring Workshop, Hong Kong, 2 febrero 2013. 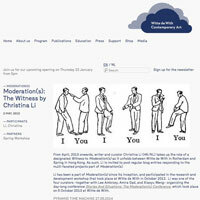 Taller, ”Moderation(s)”, Asia Art Archive, Hong Kong, 31 enero 2013. (MCL) Conferenciante, Profesiones culturales: el comisario, Aula de Cultura CAM, Murcia, 17 octubre 2012. Readers' Circle: 100 Notes—100 Thoughts, 'Lawrence Weiner IF IN FACT THERE IS A CONTEXT', dOCUMENTA (13), 9 septiembre 2012. Conferenciante, 'El contrato curatorial: analogías y casos de estudio', Centro Galego de Arte Contemporáneo, Santiago de Compostela, 14 junio 2012. Conferenciante, 'Working with Artists and Audiences on Commissions and Residencies', March Meeting 2012, Sharjah Art Foundation, Sharjah, Emiratos Árabes, 17–19 marzo 2012. Conferenciante y panelista,'Antimonumento. Crítica en el espacio público', Espai d'Art Contemporani Castelló, 22 octubre 2011. Conversación con Lara Almarcegui y Cuauhtémoc Medina, TENT, Rotterdam, 19 Mayo 2011. Mesa redonda, IMAGINE - towards an eco-aesthetic, Kunsthal Arhus, Centre for Contemporary Art, Århus, 22 enero 2011. Presentación sobre 'Vic Cambrils Barcelona...A Library Project', Midway Contemporary Art, Minneapolis, 21 Octubre 2010. Presentación de la práctica artística de Lara Almarcegui y de 'Portscapes', estudiantes de CUArch (The Catholic University of America School of Architecture and Planning) y UTSA CoA (The University of Texas at San Antonio College of Architecture), Collective Intelligence por Polyplicity, Barcelona, 22 Marzo 2010. Conferenciante, 'La evolución de las relaciones entre los artistas, el cambio climático y las nuevas responsabilidades', Nottingham, Inglaterra, 26 noviembre 2009. Fórum expertos, Máster Online, 'Arte Actual: Análisis y Gestión', Universitat de Barcelona, 23–24 Noviembre 2009. Conferenciante, Arte y Ecología, The Wanås Foundation, Knislinge, Suecia, 21 Octubre 2009. Conferenciante, 'Producir, Exponer, Interpretar (Estrategias y conflictos en la práctica curatorial hoy)', Matadero Madrid, 25–27 septiembre 2009. Moderadores, charla con Neil Cummings, ‘Museum Futures’, Arnolfini, Bristol, 18 Julio 2009. Conferenciante, ‘El Canòdrom, un nuevo equipamiento en Barcelona visto por artistas, críticos y comisarios’, MACBA, Barcelona, 6–7 Julio 2009. Presentación, '¿Qué vamos a hacer después de hacer lo que haremos después? ', parte de 'El principio de incertidumbre', Capella MACBA, Barcelona, 10 Junio 2009. Conferenciante, 'Out of the Studio! A symposium on art and public space', Hasselt, Bélgica, 26–28 Octubre 2007. Panelista, 'Qui Enter Atlas. International Symposium of Young Curators', 3–5 June GAMeC, Bergamo y 19-21 Octubre 2007 en S.M.A.K., Ghent. Seminario, ‘Barcelona / Such a beautiful horizon: Critical social infrastructure to promote art scene health resilience’, BAR Tool #2, Barcelona, 29 octubre 2018, 22 enero y 5 marzo 2019. Dirección programa (Lead Faculty), ‘Geologic Time’, Banff International Curatorial Institute, Banff Centre for Arts and Creativity, Canadá, 11 septiembre–6 octubre 2017. Tutores, BCN Producció 2017, Institut de Cultura de Barcelona. Proyectos de David Mutiloa; Anna Moreno y Camille Orny & Magda Vaz. La Capella, Barcelona, temporada 2017–18. Tutores, BCN Producció’16, Institut de Cultura de Barcelona. Proyectos de Pau Magrané, Antoni Hervàs y Joana Hurtado Matheu. La Capella, Barcelona, temporada 2016–17. Taller, ’Near Future Artworlds Curatorial Disruption Foresight Group', parte de Extra Special People, Eastside Projects, Birmingham, 15 noviembre 2015. Taller y ponencia, 'Más allá de la rotonda, o ¿qué es público en el arte público? ', organizado por consonni como parte de LaPublika, Tabakalera, Donostia, 10–11 noviembre 2015. Seminario, módulo Professional Development, MA Curatorial Practice, California College of Arts, San Franscico, 8 septiembre 2015. Profesor invitado (Guest Faculty), ‘Blueprint for Happiness’, The Banff Center, Banff, Canadá, 27 Julio–7 Agosto 2015. Tutores, International Curatorial Retreat. Organizado por Vessel y el Doctorado Curatorial Practice Program, Monash Art Design and Architecture (Melbourne), Bari, 9–13 mayo 2015. Taller, Open Set – Graphic Design Summer School in Rotterdam, Witte de With, Rotterdam, 31 julio 2014. Tutores, Curating Lab 2014 Curatorial Intensive, National University of Singapore y Hong Kong, 11–20 junio 2014. Seminario y conferencia, PhD Curatorial Practice, MADA | Monash University Art Design & Architecture, Melbourne, 14 mayo 2014. (MA) Conferenciante, IDEP Escuela Superior de Imagen y Diseño, Barcelona, 12 marzo 2014. (MCL) Conferenciante, curso "ON MEDIATION. Teoría y Prácticas Curatoriales en el arte global", Facultat de Geografia i Història, Universitat de Barcelona, Barcelona, 27 noviembre 2013. Conferenciante invitado, curso "Comisariando el presente. Teoría y práctica de la exposición de arte contemporáneo", La Casa Encendida, Madrid, 16 noviembre 2013. Conferenciante invitado, Master Visual Arts (MAVIS), Dublin, 8 marzo 2013. Tutores, Nature Addicts! Fund Travelling Academy, en el contexto de dOCUMENTA (13), Kassel, 11–15 septiembre 2012. Conferenciante, Máster en Arte, Museología y Crítica Contemporáneas, Universidad de Santiago de Compostela, 15 Junio 2012. Directores proyecto y tutores, Campus, Espai Cultural Caja Madrid, Barcelona, 4–29 julio 2011. Seminario, curso A*Study, 'Prácticas curatoriales. Sobre los distintos formatos de las prácticas curatoriales', organizado por A*Desk, Barcelona, 9–13 mayo 2011. Forum de expertos, Máster en Arte Actual: Análisis y Gestión, Universitat de Barcelona (online), 23–24 octubre 2009. Conferenciante, MA Curating Contemporary Art, Royal College of Art, London, noviembre 2009 & octubre 2008. Conferenciante, De Appel Curatorial Programme, Amsterdam, febrero 2009. 2016: “El misterio de Caviria” de Antoni Hervàs obtuvo el Premi Ciutat de Barcelona de Artes Visuales y el premio al Proyecto Artístico otorgado por la Associació Catalana de Crítics d’Art. Tutorizado por Latitudes. 2015–19: (MCL) Secretaria y vocal de la Fundació Privada AAVC que gobierna a HANGAR Centre de Producció i investigació d'arts visuals, Barcelona. 2012: Beca inaugural de investigación BCN Producció '12, Institut de Cultura de Barcelona, Ajuntament de Barcelona, Barcelona. 2012–14: Miembros de International Association of Curators of Contemporary Art (IKT). 2010–13: Miembros de la Comisión de programas, Hangar, Barcelona. 2010: Premio inaugural, GAC 2010 al comisariado, Gremi de Galeries d'Art Catalunya. 2018: (MCL) Premi Ciutat de Barcelona, Artes Visuales, Institut de Cultura de Barcelona, Ajuntament de Barcelona. 2017: Barcelona Producció 2017, concesión de 18 becas de producción, Institut de Cultura de Barcelona, Ajuntament de Barcelona. 2016: (MCL) Premi Creació, Fundació Ramon Llull 2015, Promoción Internacional de Cultura Catalana, Barcelona. 2016: BCN Producció 2016, concesión de 9 becas de producción, Institut de Cultura de Barcelona, Ajuntament de Barcelona. 2015: Premio #Opening, ARCOmadrid, Madrid. 2015: Nominadores del Aimia | AGO Photography Prize, Art Gallery of Ontario, Canada. 2011, 2012 y 2013: 'Curatorial Open Call' Galería NoguerasBlanchard, Barcelona/Madrid. 2011: (MCL) Premios GAC 2011, Barcelona. 2011: Sala d’Art Jove, concesión de becas temporada 2012, Barcelona. 2008: Premio Miquel Casablancas, concesión de becas de producción, Centre Cívic Sant Andreu, Barcelona. Welcome to the Neighbourhood, Askeaton Contemporary Arts, Askeaton, 20–29 julio 2018. Residencia investigación, CAPC musée d’art contemporain de Bordeaux, abril–mayo 2016. Kadist Art Foundation, San Francisco, 26 agosto–9 septiembre 2015. Residencia curatorial, Gertrude Contemporary, Melbourne, 12 mayo–7 junio 2014. Spring Workshop, Hong Kong. Parte del programa anual Moderation(s), 7 enero–10 Febrero 2013. Deutsche Börse Programa Residencias, Frankfurter Kunstverein, Frankfurt, agosto 2008. Pablo Larios, ‘curated_by Viennaline: Other Gallery Shares Should Take Note’, frieze.com, 25 septiembre 2018 (impreso, noviembre-diciembre 2018). Max L. Feldman, ‘CURATED BY_VIENNA 2018’, Spike Art Magazine, 25 septiembre 2018. Tom Jeffreys, ‘Looking Back 2017: Paris’, frieze.com, 8 diciembre 2017. Frank Browning, “Death and Transfiguration’, Huffington Post, noviembre 28, 2017. Vanessa Graell, “Fuera del “white cube”’, Suplement Tendències, El Mundo, 29 septiembre 2016. Montse Frisach, ‘Art, un missatge no rebut’, El Punt Avui, 1 octubre 2016. Jörg Heiser, ‘Around Town’, Frieze, enero-febrero 2016. Amanda Lee Koe, ‘Hauntological trajectories in “When Does An Exhibition Begin And End?’, Art Asia Pacific's blog, 23 julio 2014. Miguel Amado, ‘Iratxe Jaio and Klaas van Gorkum’, Artforum, Critics' Picks, 3 abril 2014. Zoe Li, ‘Moderation(s)": Witte de With and Spring Workshop In Year-long Collaboration’, Blouin ArtInfo Hong Kong, 11 enero 2013. Paul Schmelzer, ‘#OpenCurating: Yasmil Raymond on Curatorial Ambassadorship’, Walkerart.org, 12 marzo 2013. John Jervis, ‘Spring Workshop and “Moderation(s)”’, Art Asia Pacific blog, 1 febrero 2013. Jolien Verlaek, ‘State of the arts: Spain - the Netherlands. Interview Mariana Cánepa Luna’, Metropolis M, 18 febrero 2012. Paula Barriobero, 'Artists at Work: Iratxe Jaio & Klaas van Gorkum', Afterall Online, 8 febrero 2012. Vanessa Graells, ‘...y desde el backstage’, El Mundo, suplement Tendències, 2 febrero 2012. Javier Díaz-Guardiola, ‘Comisarios, la nueva hornada’, ABC, 1 abril 2011. Maaike Lauwaert, ‘3 x Brussel Gladstone, Hufkens, MSSNDCLRCQ’, Metropolis M (online), 28 marzo 2011. Claude Lorent, 'Sources de la vie moderne', Arts Libre #95, 25 marzo 2011. Ole Bak Jakobsen, 'Grøntsager på Maldiverne i den postpetrolistiske tidsalder', www.kunsten.nu, 24 enero 2011. Isabel Margalejo, ‘6 Nuevos Comisarios’, AD Architectural Digest España, noviembre 2010. Luc Sante, 'Disappearing Ink', The New York Review of Books's blog, 1 noviembre 2010. Blake Gopnik, 'The Last Newspaper', The Washington Post, 21 octubre 2010. Holland Cotter, 'Art and News, Intersecting in the Digital Age', The New York Times, 7 octubre 2010. Carlo McCormick, ‘Paperview art: Latitudes’, Paper Magazine, New York, octubre 2010. Juan Palomo, ‘Otras Latitudes’, elcultural.com, 30 julio 2010. Janine Armin, ‘The creative landscape of independent curators’, The New York Times, 15 junio 2010. Javier Hontoria, ‘No Soul for Sale, arte al margen del mercado’, El Cultural, 13 mayo 2010. Carol Vogel, ‘Inside Art’, The New York Times, 22 abril 2010. Miguel Amado, ’Portscapes’, Critics’ Picks, Artforum, 6 abril 2010. Giancarlo Politi, ‘A Hundred and one curators’, Flash Art, marzo-abril 2010. Teresa Sesé, ‘De profesión: comisario’, La Vanguardia, 2 enero 2010. Cecilia Alemani, 'The Bruce High Quality Foundation: Our future is about expansion', Mousse Magazine, Issue #20, septiembre 2009. Sandra Smallenburg, 'Doelloos dobberen voor de kunst', NRC Handelsblad, 29 agosto 2009. Pieter Kottman, ‘Jan Dibbets’, NRC Handelsblad, 14 febrero 2009. ’Dibbets does it again’, Metropolis M, 9 febrero 2009. Bea Espejo, ‘De profesión: comisario’, El Cultural, 31 julio 2008. Emily Verla Bovino, ‘Greenwashing’, Critics’ Picks, Artforum, abril 2008. Brian Dillon, ‘Land, Art: A Cultural Ecology Handbook’, Frieze #108, julio–septiembre 2007, p. 49. Vienna Art Week, 18–22 noviembre 2018. Young Curators Invitational, Organiza Fondation d’Entreprise Ricard, Institut Français y FIAC, París, 21–26 octubre 2013. Visita a Atenas. Organizado por Athens Biennial, 11–16 octubre 2013. Visita a Dublín y Derry, Organizado por el Dublin City Council Arts Office, Irlanda e Irlanda del norte, 8–14 marzo 2013. Mondriaan Foundation Orientation Trip, Amsterdam, Rotterdam y Utrecht, 18–22 julio 2011. Christina Li, Interview on 'Incidents of Travel' and Moderation(s), Página web de Witte de With, 2 mayo 2013. 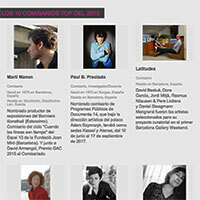 Gustavo Perez Diez, ‘Los 10 comisarios españoles del 2015’ ARTEINFORMADO, 4 enero 2016.